A second-generation Russian cosmonaut, a Japanese physician-astronaut and a NASA shuttle veteran were cleared for launch Tuesday aboard an upgraded Soyuz spacecraft bound for the International Space Station, a mission that will boost the lab's crew back to six and set the stage for a final shuttle resupply mission next month. "Because of chance, we will be there for the last shuttle mission and that is going to be an amazing time, the end of a 30-year program that has been hugely successful and very important for human spaceflight," Fossum said at a pre-launch news conference. "We're proud to be part of that." 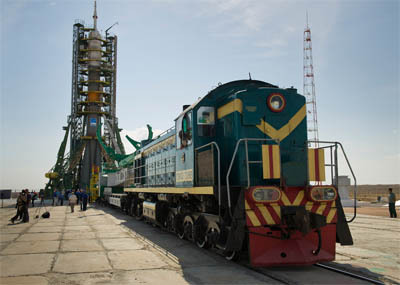 Fossum, Soyuz TMA-02M commander Sergei Volkov and flight engineer Satoshi Furukawa were scheduled for liftoff from the Baikonur Cosmodrome in Kazakhstan at 4:12:45 p.m. EDT (GMT-4; 2:12:45 a.m. Wednesday local time). It will be the second Soyuz flight for Volkov, who spent 199 days in space in 2008 and served as commander of the International Space Station's 17th expedition. Fossum is a veteran of two shuttle missions in 2006 and 2008 while Furukawa, a Japanese surgeon-turned-astronaut, is making his first flight. This will be the second launch of an upgraded Soyuz with an improved digital avionics system that is more capable, yet lighter, than the preceding model. "We're seeing a new generation of Soyuz vehicles come on line, the digital Soyuz," said Bill Gerstenmaier, chief of space operations at NASA Headquarters. "Even though it looks to us from the outside like kind of the same vehicle, things appear repetitive, that's not the case at all. The Russians are continuing to upgrade, continuing to modernize, continuing to look at the ways the vehicle is operated to make improvements. "I think that's important for us to remember that we stay sharp, we stay good by putting changes in, continuing to upgrade, modernize in small areas and keep moving forward. Those are very important to the overall health of the station." If all goes well, Volkov will oversee an automated approach and docking at the space station's Earth-facing Rassvet module around 5:22 p.m. Thursday. Standing by to welcome the crew aboard will be Expedition 28 commander Andrey Borisenko, Alexander Samokutyaev and Ronald Garan, who were launched to the lab complex April 4 aboard the Soyuz TMA-21 ferry craft. Volkov, Furukawa and Fossum are replacing three other station crew members -- Dimitry Kondratyev, Paolo Nespoli and Catherine "Cady" Coleman -- who returned to Earth May 23, midway through a visit by the shuttle Endeavour. With the Expedition 28 crew back up to six, the astronauts and cosmonauts will face a busy month of work preparing for the arrival of the shuttle Atlantis two days after launch on July 8. Atlantis' mission is the final flight of a space shuttle and NASA has loaded it up with enough supplies to support the station crew through 2012. "Because it's the last flight and all participants of ISS program would like to bring as much spare parts as possible, the shuttle will be full (of) equipment and food and needed stuff," Volkov said in a NASA interview. "That is why it's a lot of transportation work, we will unload the shuttle and we'll fill (it) with some failed equipment and trash." Said Fossum: "We're going to have to hit the ground running, there's no doubt about that." "There's not many weeks between the time when we arrive and the space shuttle Atlantis will arrive," he said. "So we have a lot of preparation to do and we're beginning that preparation now. I've had conferences this week with the EVA team, with Chris Ferguson, the Atlantis commander. Two nights ago I spent an hour talking to Ron on orbit about what's going on and the kind∫ of preparations he's doing to get ready for us up there. So we're excited about it. There's always an adaptation time when we get there, but we're going to hit the ground running. We have to." Because Atlantis will be using NASA's final external tank and the agency's last set of solid-fuel boosters, there will not be another shuttle on standby for a possible emergency rescue mission. As a result, Atlantis will launch with a reduced crew of four. If a problem of some sort prevents a safe re-entry, the shuttle crew will move in aboard the station and rotate home aboard Soyuz ferry craft. With the U.S. segment of the space station complete, the Atlantis astronauts will be focused on resupply. One spacewalk is planned during their visit, but it will be carried out by Fossum and Garan. "Ron Garan and I, we're really lucky to be here, in this place at this time," Fossum said. "We flew together on (shuttle mission) STS-124 in 2008 we have about 21 hours of spacewalk time together and two to three hundred hours of spacewalk training together, and so we're already a very experienced spacewalk team. I think as they were looking at the crew mix and the best way to use people and weight, they just decided to toss Ronnie and I back into the EVA arena we're happy to do that. ... It's very challenging and, it's very physically and mentally challenging, but at the end of the day you feel good what you've accomplished." A major priority of the spacewalk is to move a broken ammonia coolant system pump module to Atlantis for return to Earth and troubleshooting to figure out what went wrong. "This is part of the cooling system that pumps ammonia through the radiators to dump the heat to space and to keep all of the computers and people at a comfortable operating environment inside," Fossum said. "Those pump modules were made to operate longer than they've ended up operating. It failed early, basically, and there's a really high priority put on getting that pump module back to the ground so we can really analyze it and figure out why did it fail early, how can we improve space systems to operate ... for years at a time. Very important learning how to continue to live and work in space." After moving the failed pump module to Atlantis, Garan and Fossum will install an experimental robotic refueling system and carry out minor maintenance on the station. When Atlantis departs, the focus of the station program will shift from maintenance and assembly to science operations, or utilization in NASA-speak. "They're going to help us with this transition, where we're going to start thinking more of allocating time to utilization and all the systems work will have to fit within what's left," said Michael Suffredini, space station program manager at the Johnson Space Center in Houston. "Up to this point, we've been operating a little differently, all the systems were the priority and utilization got what was left. So this is a major transition for us as a program and the crew will be a big part of helping us do that."